Lace is my favorite fabric to play with, bar none. It’s romantic, luxurious and incredibly feminine! Over the last year, I’ve styled it here in London, here with my favorite trench, and here for a night out. 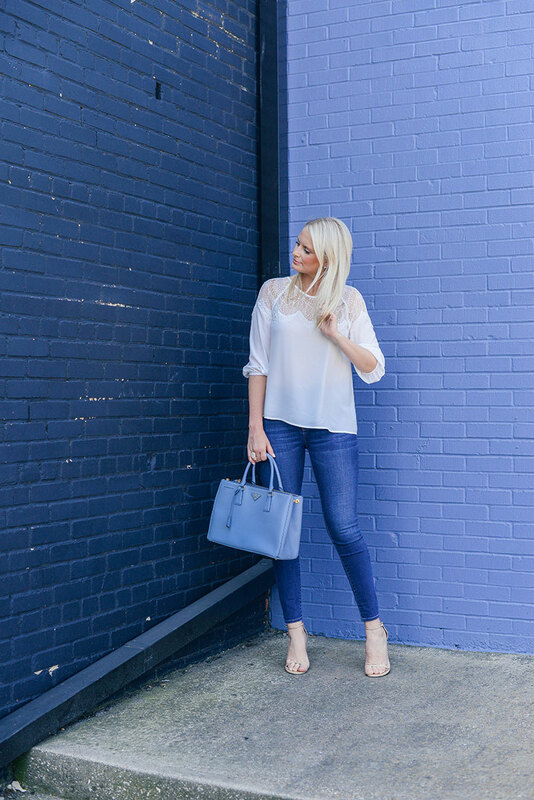 Lace tops like this one instantly elevate any pair of jeans. It’s an easy outfit I can wear from work to dinner with zero hassle! This top is so lightweight, which is exactly what one needs in 105 degree temps. It’s such a simple, no-hassle piece, so it’s easy to style with a bunch of different things. Did I mention it’s under $100? For a casual, everyday look, try this lace-hemmed tee. Looks adorable with shorts and jeans! It’s also only $55. Be party or wedding-ready in this Cynthia Rowley number. Pair this relaxed cold-shoulder top with jeans and heels for an understated date night outfit. I’m obsessed with the navy and black color combo on this skirt. Such a fun look for a night out! The details on this top (like the gorgeous bell sleeves) make it a unique and stylish piece for any occasion. For a fun pop of color, try this orange-red DVF dress, this yellow Adam Lippes number and this Oscar de la Renta top in a rich plum hue. Oh i love this look – the shoes are amazing! I have to get these sandals, they are such a great pair. Perfectly chic as always! Have a great day ahead, Merritt! Such a pretty top! So classic and versatile! You can style this a million different ways! LOVE your blue Prada bag!! So chic! 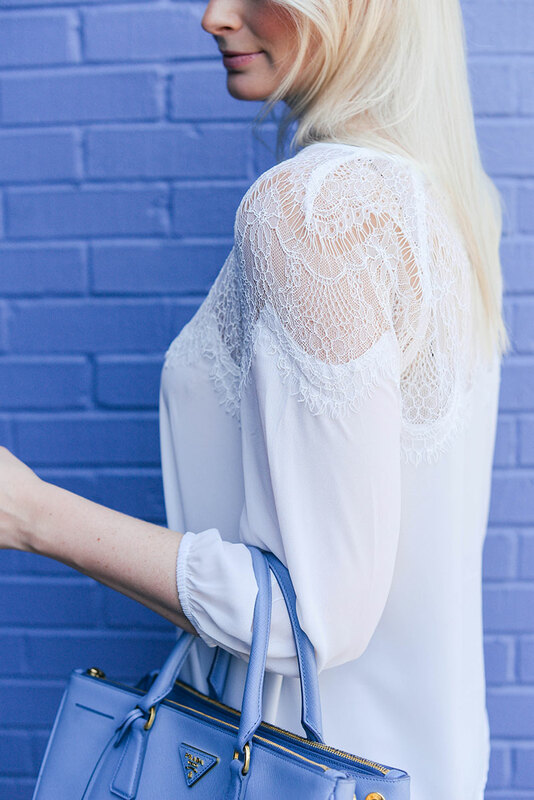 I don’t have nearly enough lace in my closet but you’re right, it’s such a luxe, feminine detail! 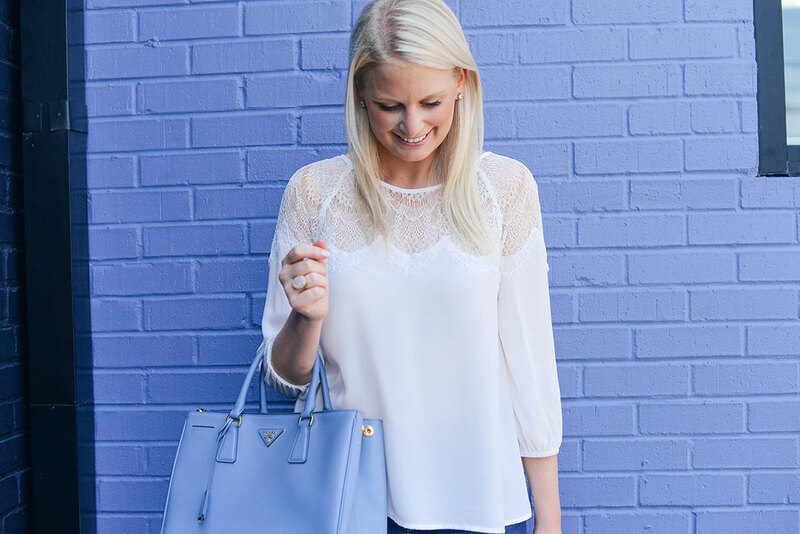 Live how chic this top looks with a simple pair of jeans! Such a pretty top! I have a similar C&C dress that you are reminding me I need to wear more!! Love this top on you, Merritt! So pretty. What a lovely easy look!